I was kind of hoping your response would put me off buying it not encouraging me xD. Although I do kind of feel like the turbo lag might mess with the feel of the 350, i really like the instant power pretty much anywhere in the rev range xD. So its not so much turbo lag as throttle lag? So you get all the power at once but with a sort of hesitation from the car? From what I understand about engines individual throttle bodies are about the quickest you could get your throttle response because of how short the travel is i think? I was considering some pop chargers to get some induction noise They seem to have quite a good reputation unless ive missed the horror stories. Upgrade? It’s a window switch, am I missing something? Has auto control of passenger window. Its got auto passenger up switch. One of the best mods I did to mine, however I got mine for £4 including postage from Japan and it also included the passenger side switch unit lol. Ahhh, missed that. Never worth £75, though at £4 it’d be a great wee mod. Guess who's backkkk! this thread still going lol? Nismo Spolier in gunmetal grey... Anyone fancy picking this up for me and posting? 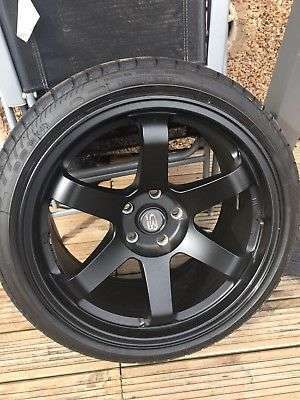 Some nice rims FS in the Midlands. got to be good for someone? Nice. Wonder what that will go for. Would love it, Not quite there in life yet though.